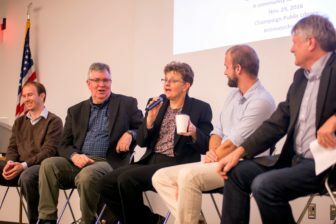 From warmer temperatures and increased heavy rainfall events to new types of mosquitoes and crop loss, Central Illinois is already seeing the effects of climate change, experts said at the Climate Change in Illinois conversation hosted by the Midwest Center for Investigative Reporting. Julie Pryde, administrator of the Champaign-Urbana Public Health District, speaks at "Climate Change in Illinois: A community conversation", sponsored by the Midwest Center for Investigative Reporting, on Tuesday, November 29, at the Champaign Public Library. Angel was one of four speakers at the hour-and-a-half discussion, joining Justin McGrath, a postdoctoral researcher in crop science at the University of Illinois; Julie Pryde, administrator of the Champaign-Urbana Public Health District; and Andrew Rehn, a water resources engineer at Prairie River Network. Despite a president-elect that has claimed climate change is a hoax, the experts said there is no doubt that changes in the environment are having an effect on public health, agriculture and infrastructure. Angel said that the future is hard to predict, but it’s likely that Champaign-Urbana’s average temperature could be 4 or 5 degrees Fahrenheit higher by midcentury. In addition to greater heat waves, Pryde said that one clear change has been the recent emergence of the Asian tiger mosquito, which can carry the Zika virus, in this area. She also said another clear visible trend has been increased green mold on the side of houses – a sign that there is likely more mold in homes, exacerbating allergies and asthma. Pryde said many of the people most likely to be affected are those who are particularly vulnerable – people without screens or air conditioning, people who can’t treat their home for mold. Climate change threats like these pose a huge monetary cost in terms of health issues, and McGrath said that smart regulations can save money and the environment. He gave the example of reducing the greenhouse gas emissions of cars and how it reduced smog in New York City, making the air cleaner to breathe and potentially saving money on asthma and other health problems. McGrath said that while much climate skepticism exists, the government should follow the lead of large companies with stakes in the environment, which are investing heavily in research to adapt their products to climate change. For example, Monsanto is pursing drought-tolerant crops and BP is investing in advanced biofuels. “These aren’t bleeding heart liberals. These are people who like cash, and they are betting on a future that is warmer. They’re betting on a future that has unpredictable rainfall. They’re betting on a future with less fossil fuels,” McGrath said. In Central Illinois, increased rainfall has already led to more flooding events. Rehn said that could mean more erosion of crops, more chemicals in the waterways and, potentially, more pollutants from landfills and former industrial sides. “Flooding is increasing, and it’s a driver of a number of major environmental problems,” Rehn said. He said the state and local governments needs to invest in infrastructure to counteract flooding as it increases. In addition to flooding, many aquatic animals, like mollusks, fish and amphibians, are at risk because they are unable to change their location but aren’t likely able to adapt to changing temperatures. Still, Angel said that Central Illinois is in relatively good shape compared to many other areas across the globe.